The Nato-led coalition in Afghanistan will launch a long-planned offensive in the southern city of Kandahar in June, military officials have said. A US military source was quoted as saying the goal was to rid the city of Taliban forces before the Muslim holy month of Ramadan begins in August. 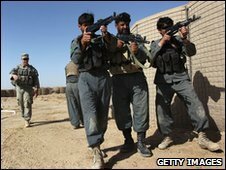 US troops are already leading a massive operation in Marjah, in the neighbouring province of Helmand. Extra troops ordered by US President Barack Obama have begun arriving. Some 6,000 of the 30,000 additional forces assigned to Afghanistan in December have already arrived, with the rest expected in the coming months. US officials had previously disclosed plans for a Nato-led offensive in Kandahar - the birthplace of the Taliban - but had not said when it might happen. The officials - who spoke on condition of anonymity - said some 10,000 troops would be involved in the main thrust of the operation. They told Reuters news agency it would include a militant "clearing" phase from June to August, followed by a smaller "secure and deliver government" phase that is expected to last at least until mid-October. They said US troops were already working on securing transit routes and persuading leaders of districts surrounding Kandahar to co-operate with coalition forces. Mr Obama, who made his first visit to Afghanistan as US president on Sunday, told US forces that they were there to help Afghans to forge a "hard-won peace". He met Afghan President Hamid Karzai and stressed the need to tackle corruption and fight against drug-trafficking. US officials are due to conduct a review of the Obama administration's war strategy later this year, with a view to a gradual withdrawal beginning in July 2011.